Being a writer is a hard work and anybody who has dabbled in writing, albeit occasionally, will bear testimony to the fact. Imagine having the gumption to carry on with it alongside your primary source of income, or even adopting it as your only means of livelihood. Only the madness and passion that fuels the tenacity of writers presents us with a plausible answer to why there are people who have chosen to enter into writing professionally. 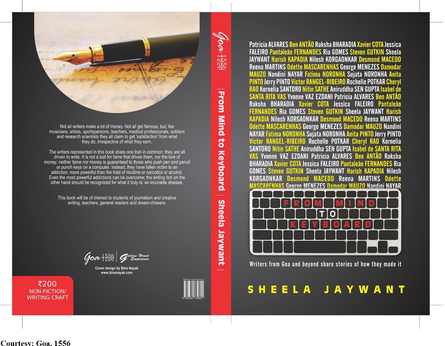 From Mind to Keyboard, edited by Sheela Jaywant and published by Goa, 1556, is a book of stories from different writers living in Goa about their journeys as writers: what set off the spark and what kept them going despite any odds that presented themselves against their choice. The contributors are not all of Goan origin, and so they provide us with an insight into a writing world and its struggles that goes beyond the narrow confines of our State. It is, nevertheless, heartening to acknowledge the number of prominent writers Goa has produced. The book has journalist Ben Antao transporting us to a pre-liberation Goa, documenting his balancing act of working for the Bombay Port Trust, writing for the Indian Express and the Goan Tribune, and commencing his MA studies, before finally coming to work for the Navhind Times in Goa under Lambert Mascarenhas. Antao talks about the requirements of being a journalist, namely the possession of knowledge that covers many areas as well as the knowledge of the specific details of a particular sphere or discipline: something that makes journalism an incredibly challenging field. He is candid about the very human limitations of journalism in presenting the absolute truth. Award winning writer and food historian Odette Mascarenhas talks about publishing woes with regard to the first book she wrote, which was about her father-in-law Miguel Arcanjo Mascarenhas, a noted Goan chef. She describes how she learnt to handle praise and criticism, moving on to write children’s books and a Goan recipe book among others in the story titled Rocky Roads Bring Out the Best in Me. An ardent lover of books since childhood, internationally and nationally acclaimed Konkani writer Damodar Mauzo confides that he once believed that Konkani could not be used as a medium for expressing prose. This fallacy was destroyed when he absorbed the writing of Shenoy Goem-Bab, eventually leading Mauzo along a path of fame. Goa Streets’ Steve Gutkin leads us through an interesting journalistic career with not a dull moment. In one of the livelier reads in the book, he recounts being stranded with the Yanomami tribesmen of the Amazon jungle, covering drug cartels in Columbia, travelling with Hugo Chavez, writing about suicide bombings and the death of Yasser Arafat in Israel and so on. The man could write a book on his own experiences as a journalist. Author Anita Pinto's verses are a fun and refreshing way of telling her story, I Write, In Verse, as she departs from the monotony of prose. The rest of the writers come from varied backgrounds including soldiers, teachers and engineers, but the commonalities in their histories are their ravenous appetite for reading, their determined focus on writing, no matter the financial repercussions, and their insatiable thirst for learning. Apart from the obvious prowess of the writers involved, Bina Nayak’s illustrations, which capture the essence of every tale told, must be commended. The book offers its readers a closer look at personalities they know only through their writing. From Mind to Keyboard makes an excellent read for young people starting out in the business of writing as it advises on pitfalls to avoid and enthuses with tales of dogged dedication to the craft. It can be recommended as a necessary addition to the reading list of students of literature and journalism.